1697. A storm gathers upon the Caribbean; a confederacy of pirates which seeks to overthrow the great houses of Europe and take for themselves the riches and bounty of the New World. As a pirate lord your goal is to assemble, by hook or by crook, the best pirate crew on your ship. Players compete in a dice challenge to determine who may place a pirate coin onto their ship. Press gang, recruit, turn another pirate into a traitor or raid other ships to form your crew. The player with the best pirate crew at the end of the game wins. 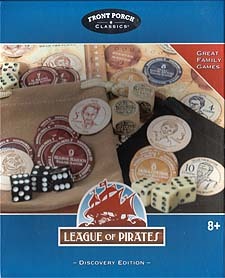 League of Pirates is a fast paced, easy to learn, head to head battle of pirate action.